Half Moon Bay is a coastal town in San Mateo County. It has a number of small shops and restaurants in the town itself and the surrounding areas off Highway 1. 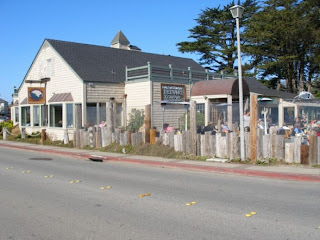 One of my favorite dining options is the Half Moon Bay Brewing Company, a restaurant on the Pillar Point Harbor that has both indoor and outdoor dining options. They also, as the name indicates, serve their own micro brews. The seafood items on their menu are Seafood Watch safe. They also have frequent live entertainment and dining or drink specials. The food is good and the location is nice. It can get crowded for dinner, especially on the weekend. Another good dining option is in downtown Half Moon Bay, the Half Moon Bay Inn. The Half Moon Bay Inn offers both dining and lodging. The Inn is located on a prominent corner in downtown Half Moon Bay near many of the small local shops and businesses. Half Moon Bay has a small arts community and you can find many unique and original items in the local shops. It is also a good place to go antiquing. Every October Half Moon Bay is host to the annual Pumpkin Festival, an event that includes arts and crafts, food, entertainment, and, of course, pumpkins.